Do you have a problem with dairy? Are you allergic to it or are you on a vegan diet? Or do you know someone that can’t have dairy? I know someone. She’s my mom and she can’t have dairy. It’s really a bummer when you can’t have a lot of the foods at someone’s house or at a restaurant because so many foods include dairy. It’s even worse when you can’t have dessert! We recently took a trip to Alabama to attend my uncle’s 95th birthday party. We celebrated his special day at a fancy place called The Club in Birmingham which has been there since the early 1960s. It was my first time there and I was so impressed by the breathtaking view of the city. And I can’t forget to mention the super cool dance floor which inspired the multi-colored lights in the famous dance floor of the movie, Saturday Night Fever. We probably had about 25-30 family members there and it was such a wonderful night. I couldn’t believe how much energy my uncle had, dancing with all the ladies and basically closing down the place at around midnight. Of course we sang happy birthday and he blew out the candles. We held up 95 glow sticks as we sang. The cake and ice cream were fabulous, but my mom couldn’t eat either because both had dairy. Cue the sad music. 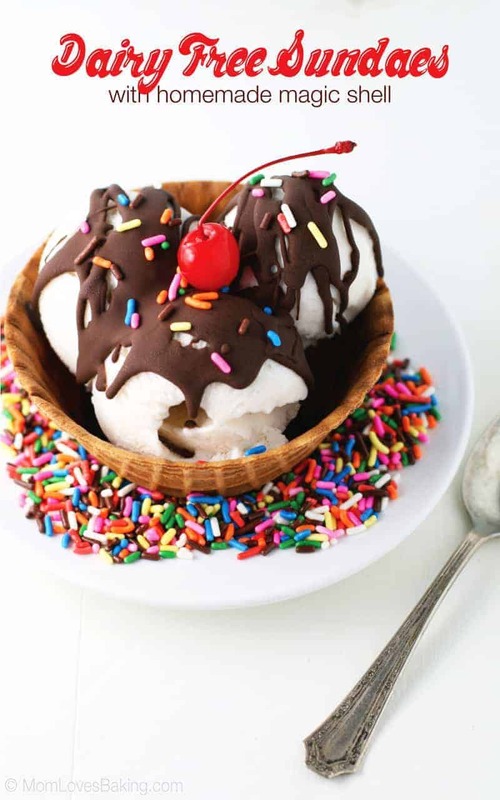 That’s why I love these Dairy Free Sundaes with Homemade Magic Shell. They’re made with So Delicious Dairy Free® which is, well, SO DELICIOUS! Plus, I’m including a recipe for super easy homemade magic shell which only has 3 ingredients. And of course it’s dairy free too, so also great if you’re vegan. Or if you’re my mom. Cue the happy music which is very appropriate since she’s a musician! 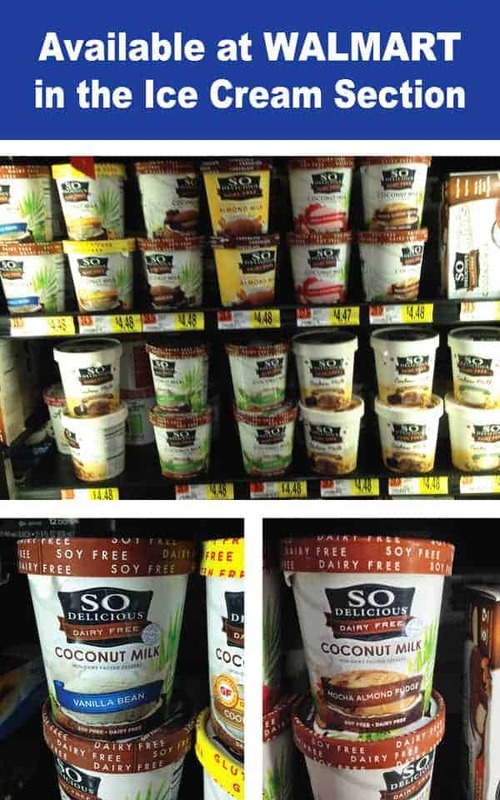 I’m so glad that Walmart carries So Delicious Dairy Free® because it’s very close to my house. Even though it’s a frozen treat and technically not ice cream, you can find So Delicious Dairy Free® in the Ice Cream section at Walmart. 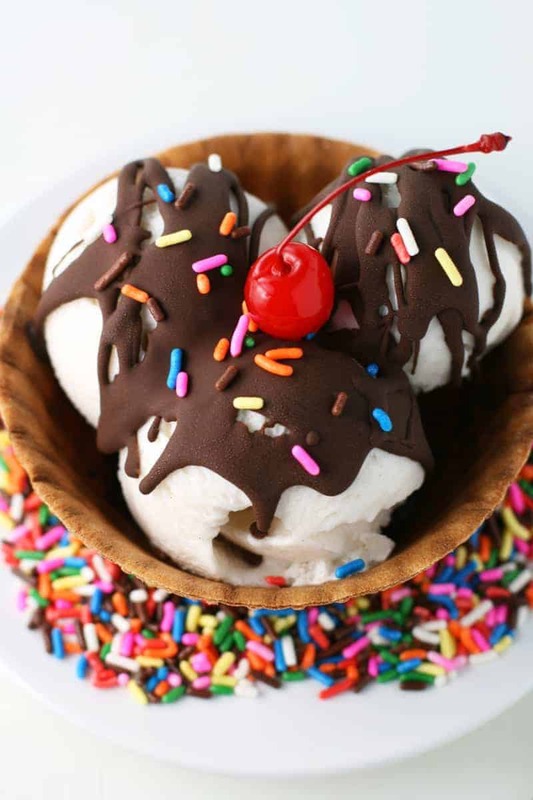 So before you make these scrumptious sundaes, you’ll need to whip up some Homemade Magic Shell. I think I might have mentioned this before, but 3 ingredient recipes are quickly becoming my all time favorite! 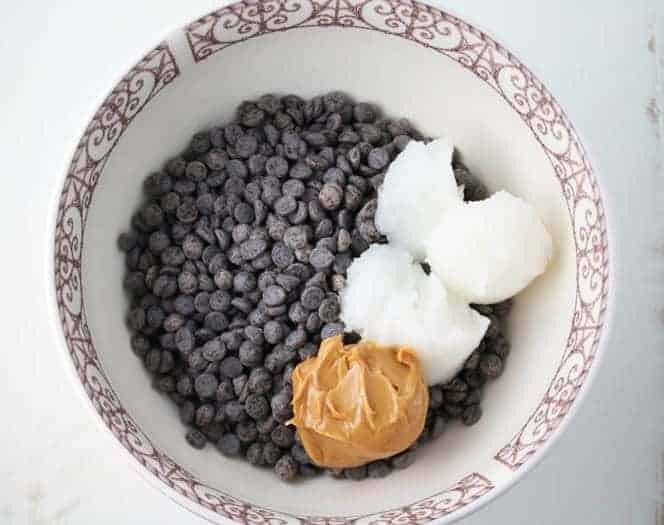 The 3 ingredients you need for this recipe are dairy free chocolate chips, coconut oil and peanut butter. 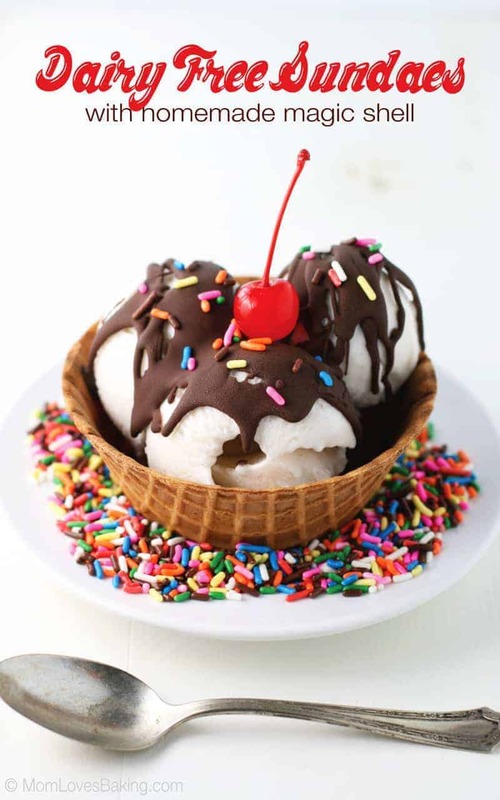 Now you can build your sundae. I chose Coconut Milk Vanilla Bean for mine, but you can use whatever tickles your fancy. There are many excellent flavors to choose from including Cashew Salted Caramel Cluster, Cashew Dark Chocolate Truffle, Coconut Milk Almond Bar, Almond Mocha Almond Fudge Bar, Coconut Milk Chocolate, Almond Milk Mocha Almond Fudge. Scoop out the amount you want and place in a bowl (or waffle bowl, if desired). If you do use a waffle bowl, just check to see if it’s dairy free. 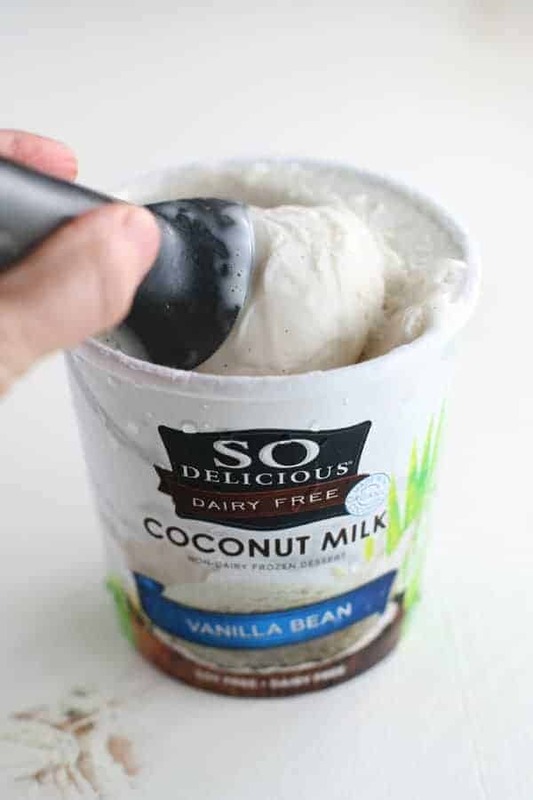 Another great thing about So Delicious Dairy Free® is that it’s 100 percent plant-based and Non-GMO Project Verified with no artificial flavors, colors, trans-fats, or hydrogenated oils. 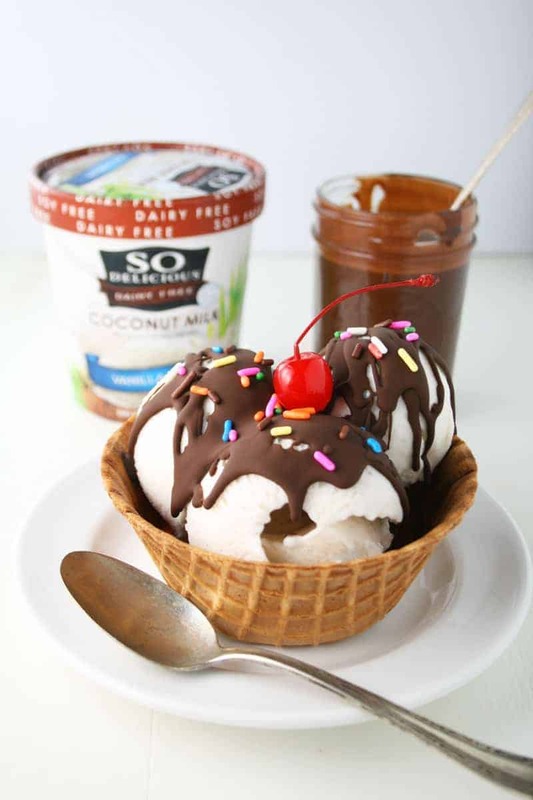 After adding your scoops of So Delicious Dairy Free®, then you can drizzle on this beautiful magic shell which is so chocolatey with a hint of peanut butter flavor. Add sprinkles and don’t forget the cherry on top! Get your spoon out and dive in. Isn’t there something about eating a chocolate sundae that makes you feel like a kid again! 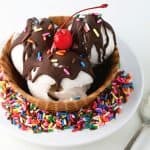 I can’t wait for my mom to try these Dairy Free Sundaes with Homemade Magic Shell. She’s going to love it! 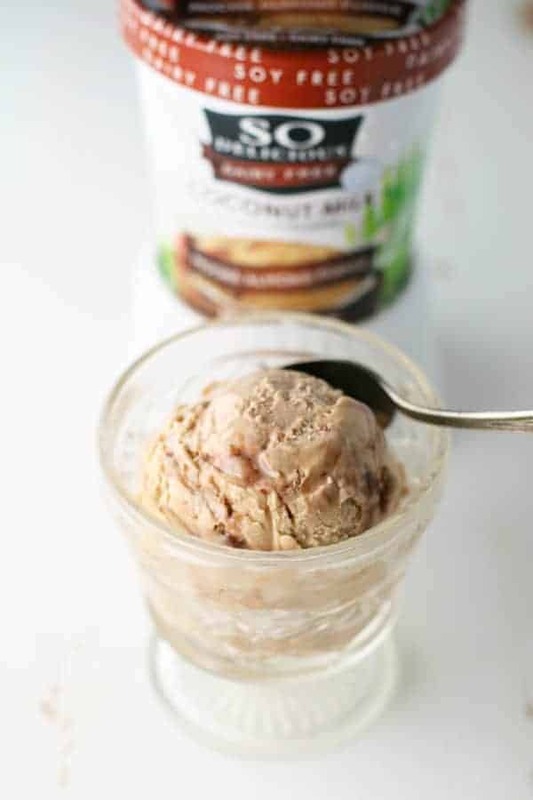 I also tried the So Delicious Dairy Free® Coconut Milk Mocha Almond Fudge flavor which was so, so good. With or without the magic shell. Click here for more #DairyFree4all inspiration. Place all ingredients in a medium sized microwave safe bowl. Microwave on high for 1 minute. Stir until completely smooth and the chips are melted. 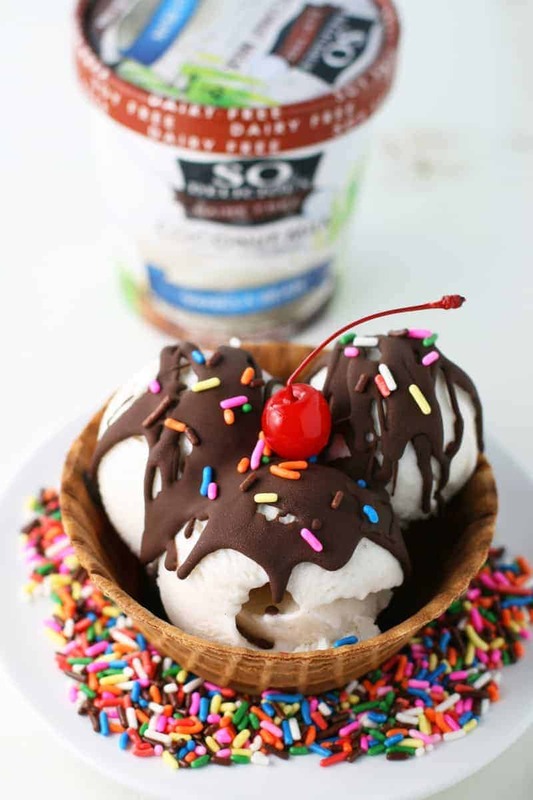 Serve with dairy free frozen dessert such as So Delicious. 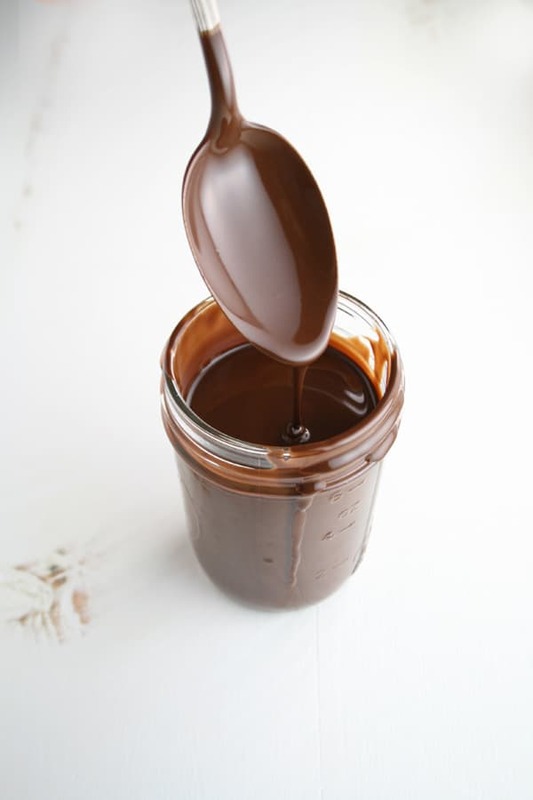 Store at room temperature in a sterilized canning jar for up to 1 month. Scoop frozen dessert into bowl or waffle cup. Drizzle magic shell over dessert. Add sprinkles and cherry. Serve immediately. My mom can’t have dairy either. It’s great that they have options now. That magic shell looks amazing.